← What If My Dog Kills My Neighbour’s Cat? All of these breeds tend to be easy-going and tolerant, and have received Animal Planet scores of 8 or 9 out of 10 for potential compatibility with other pets. These breeds tend to be more sensitive and may find living with a rambunctious dog traumatic. However, if introduced to friendly, gentle dogs at a young age (ideally between 12 and 16 weeks), even cats of these breeds can usually be integrated happily with dogs. On the other hand, introducing a small puppy or a very calm, mellow older dog into a household with an adult cat can work well in many cases, even with the more sensitive cat breeds. The worst possible combinations include a hyperactive adult dog that is prone to chasing with a timid, sensitive resident cat, or a nervous new cat with a territorial or predatory resident adult dog. Matching personality types when adopting will significantly increase the likelihood of establishing a harmonious multi-pet home. P.S. You can see all of these cat breeds on this site, starting here. You are so right here, Ruth. I hope that your reply to the original post is widely read. Readers of my own posts, if any ;-), may recall my success with a huge Mastiff and my delicate cats. I have had a lot of dog/cat combinations over many decades, and they have always gone well. And many may recall my success with several Airedales and my cats. I am persuaded that the key is reliable loving from the human, not overtly expressing any favouritism, a calm demeanour, and no ill-advised 'disciplining' of cat or dog. Looking back on my decades of experience, I believe that if the companion animals are sure of their being loved, sure of their place in the household, and are happy in their shared home, then all goes well. It has done for me. When people complain of companion animal behavioural problems, the first place I would look is at the humans. I have 8 cats,all moggies. Sometimes she would run after them to play,they knew and some of them liked to play with her. Cats allways need time to make friends or at least accept a dog-compagnon(or other cat).some need a few days,some take months,but it always turns out ok!People just need to learn to have patience,never ever abandon a pet! I have a mackerel tabby called Yoshi,I got him as a baby and he adopted my dog Ginga as his second mama,he even got her to produce milk! The main thing no matter what the breed of the cat or the dog is to ensure that the cat is not treated as a second class citizen to the dog ! I have read of people 'getting rid' of the family cat because he wouldn't accept the dog. Those people probably just put them together with no preparation and left them to get on with it. How would they like a stranger brought into their home and be immediately expected to be pleasant and share their life? Worse still are the people who have the cat declawed so he doesn't 'scratch the poor dog's eyes out' as they put it. Poor defenceless clawless cats with a life of misery keeping out of the dog's way. A clawed cat being pestered can give the dog a warning swipe, the dog soon learns to leave the cat alone. I've always said and still do, that anyone wanting a pet should first have to pass a competence test, but sadly I don't think that will ever happen ! Great lists, but Abys are on the wrong one! I've never known a cat breed to get on better with dogs, Abys just love them! My Aby was never socialised with dogs as a kitten, but now he'll curl up to them whenever he can. My grandmother had my dog before me, and her Aby absolutely adored the dog, they were never a part. Her Aby was also never socialised with dogs as a kitten. I constantly hear from all different Aby breeders and owners about how much their kittens love their new family's dog, regardless of whether they were socialised with dogs or not. I think you make a good point in the last para. A cat that is well socialized to dogs no matter what breed or random bred is the answer. 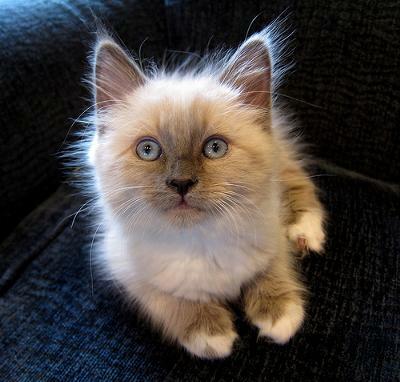 A poorly socialized Ragdoll would be unsuitable but in general these breeds have a propensity to be suitable. The potential needs to be realized in good breeding techniques. I am thinking of getting a dog and am wondering how to introduce her to my two year old cat. I would never get rid of the cat for the dog but also want the dog is there any good way to introduce them to each other? Two or three things come to mind. Breeders should make sure their dogs and cats get on fine with cats and dogs. Secondly, cats do like to choose their own friends. So, although it might be impractical, I think a new dog should be introduced to the existing cat to see if they get along before adoption. We can’t assume that the companion animal that we pick for ourselves will be the one that our cat would pick for herself. There are many multi-cat households where the cats are somewhat stressed because the owner has simply introduced new cats on the assumption that they will all get along. They do sometimes and they don’t sometimes. In feral cat colonies the cats choose their associates and companions. We should respect this. But I don’t of anyone who checks out compatibility of companion animals before adoption. In addition, a slowish introduction probably helps (different rooms etc.). But if they do hit it off early or are known to get along that solves the problem anyway. Hope this helps.